The Avian Science Center and the Wildlife Biology Program at the University of Montana are offering a professional development opportunity for undergraduate and graduate students to attend the Private Lands Partners Days 2019 conference in Ogden, Utah, from September 24 to 26, 2019. Professor Mark Hebblewhite visited SciShow to discuss ungulates, predator-prey relationships and his latest research. Students get their hands wet and their waders muddy during fish biology lab, highlighted in this article from the Missoulian. In August, doctoral candidate Matt Metz and coauthors published a paper in Nature Ecology and Evolution detailing how wolf predation impacts elk antler evolution. Metz explains the story behind the science in this blog post. 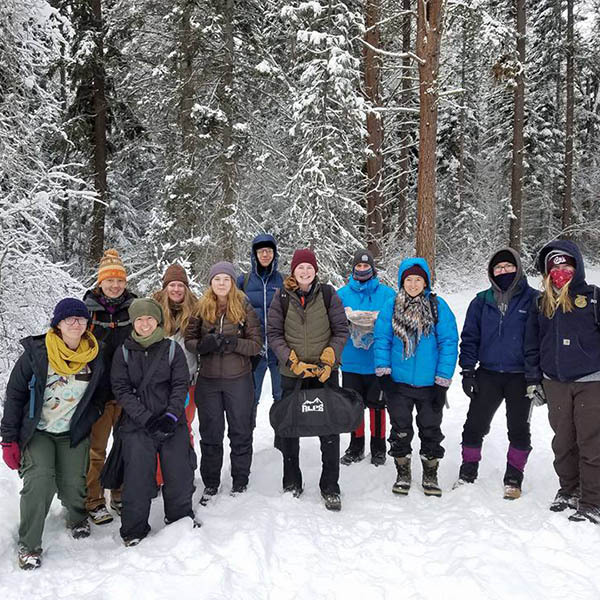 The University of Montana’s Wildlife Biology Program provides students with an extensive knowledge of ecology, population biology, wildlife biology and critical thinking and quantitative skills. Our students become leaders, bringing science to the dynamic management of wildlife and fish populations and their habitat, communities, and ecosystems. The Wildlife Biology Program is a joint program with the W.A. Franke College of Forestry and Conservation, Division of Biological Sciences, and the Montana Cooperative Wildlife Research Unit. We are ranked #1 in the U.S. and Canada for the quality and productivity of faculty research. The Wildlife Society UM Student Chapter volunteers on the Blackfoot-Clearwater Game Range, in partnership with MT Fish Wildlife and Parks and the Backcountry Horsemen of Montana to remove more than 20 miles of hazardous fencing to improve wildlife habitat. Wildlife students volunteer for Defenders of Wildlife Wolverine Watch program, setting camera traps and hair collection stations in the Bitterroot Mountains to help monitor for wolverines in this rugged wilderness area just south of Missoula.